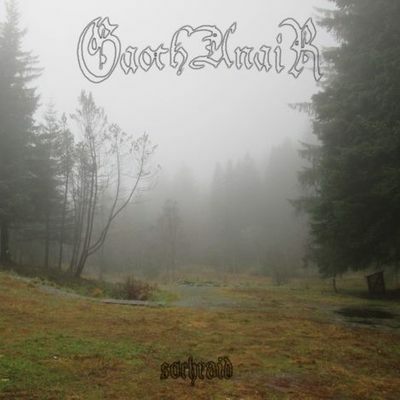 Gaoth Anair are a 1 man band from New Zealand that plays a very grim, raw and primitive form of atmospheric black metal and this is a review of their self released 2001 demo "Sochraid". Drums range from slow, mid paced to fast drumming with some blast beats being thrown into the music at times, while the bass playing has a very dark tone with riffs that follow the riffing that are coming out of the guitars. Rhythm guitars range from slow, mid paced to fast atmospheric black metal riffs that are very dark, raw and primitive sounding in the old school vein and there are no guitar solos or leads present on this recording, as for the acoustic guitars which are only used on the last song use finger picking to enhance the dark atmosphere of the demo. Vocals are mostly grim sounding black metal screams along with a brief use of clean singing chanting and spoken word parts as well as a brief use of nature samples, while the lyrics cover fantasy, and darkness themes, as for the production it has a very dark, lo-fi, raw, and primitive sound in the 90's black metal vein. In my opinion Gaoth Anair are a v ery great sounding raw and primitive atmospheric black metal band that got over looked in the end because they signed to a crappy label that had bands that where the total antithesis of black metal what black metal stands for, which the person in this project did not support himself, but if you are a fan of this musical genre, you should check out this recording. RECOMMENDED TRACKS INCLUDE "Eternal Winter" and "Under The Twilight". RECOMMENDED BUY.